Earlier this week I got this awesome gift from my friend whom also be one of my son's godmother. 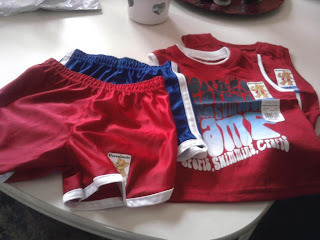 She purchase this items online and mailed it here for her godson. I was really happy when it finally arrived in the mail one morning. The mailman never knocked our door but since I check our mailbox every morning, this is what I have noticed in our door way. I can't wait to put the shirt on my son, although the shorts might be pretty too big for him. We both agree to get the bigger clothes that way my son could start wearing it now then probably when his older enough he could still wear this. Mothers were more excited for their children's things for them I guess. I am also considering about knowing the Parts Gorilla. If you don't know it is where you can buy new auto parts for your vehicles. Since we have the other car that just sits in front of our garage. I want to learn how to drive, get my license and get my own car. Good thing I know where to look at once we have the money to buy the new parts for that car. Our site offers online access to multiple automotive part stores.